A Design/Build 600-car parking structure. W.M. Klorman Construction Corporation was the Design/Build Contractor and self performed the concrete portion of the project. 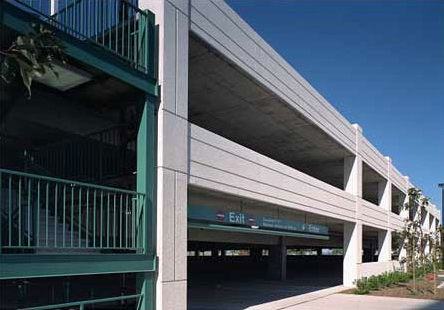 The Parking structure was a unique, ductile moment frame design (no shear walls) and was designed with the anticipation of a 4 foot vertical settlement in the soil. The building was built using a catholically protected “H” pile foundation system that extended approximately 200 feet downward into the bay mud and activated by a Post-tensioned mat foundation slab. The building was built over an area of reclaimed land that was once the San Francisco Bay and converted into a municipal land fill ultimately capped with clay soil which created complex challenges that Klorman Construction successfully and creatively overcame.